Jay Guo holds up a piece of the transparent silver film. Photo: Joseph Xu/Michigan Engineering. The thinnest, smoothest layer of silver that can survive air exposure has been laid down at the University of Michigan (U-M), and it could change the way touchscreens and flat or flexible displays are made. It could also help to improve computing power, enhancing both the transfer of information within a silicon chip and the patterning of the chip itself through metamaterial superlenses. By combining the silver with a little bit of aluminum, the U-M researchers found that it was possible to produce exceptionally thin, smooth layers of silver that are resistant to tarnishing. And by applying an anti-reflective coating, they were able to make one thin metal layer up to 92.4% transparent. The team showed that the silver coating could guide light about 10 times as far as other metal waveguides – a property that could make it useful for faster computing. They also layered the silver films into a metamaterial hyperlens that could be used to create dense patterns on silicon chips with feature sizes a fraction of those possible with ordinary ultraviolet patterning methods. The researchers report their work in a paper in Advanced Materials, while U-M has applied for a patent on the technology and is seeking partners to help bring it to market. Screens of all stripes need transparent electrodes to control which pixels are lit up, but touchscreens are particularly dependent on them. A modern touchscreen is made up of a transparent conductive layer covered with a nonconductive layer, allowing it to sense electrical changes where a conductive object – such as a finger – is pressed against the screen. "The transparent conductor market has been dominated to this day by one single material," said Jay Guo, professor of electrical engineering and computer science at U-M. This material, indium tin oxide, is predicted to become expensive as demand for touchscreens continues to grow; there are relatively few known sources of indium. "Before, it was very cheap. Now, the price is rising sharply," Guo said. 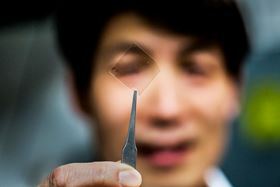 The ultrathin silver film could be a worthy successor. Usually, it's impossible to make a continuous layer of silver less than 15nm thick, or roughly 100 silver atoms. According to Guo, silver has a tendency to cluster together in small islands rather than extend into an even coating. By adding about 6% aluminum, however, the researchers were able to coax the metal into a film of less than half that thickness – 7nm. What's more, when they exposed the film to air, it didn't immediately tarnish as pure silver films do. After several months, the film maintained its conductive properties and transparency. And it was firmly stuck on, whereas pure silver comes off glass with Scotch tape. These oscillations encode the frequency of the light, preserving it so that it can emerge on the other side. While optical fibers can't scale down to the size of the copper wires on today's computer chips, plasmonic waveguides could allow information to travel in optical rather than electronic form for faster data transfer. As a waveguide, the smooth silver film could transport the surface plasmons over a centimeter – sufficient for use inside a computer chip. The plasmonic capability of the silver film can also be harnessed in metamaterials, which handle light in ways that break the usual rules of optics. Because the light travels with a much shorter wavelength as it moves along the metal surface, the film alone acts as a superlens. Or, to make out even smaller features, the thin silver layers could be alternated with a dielectric material, such as glass, to make a hyperlens. Such lenses can image objects that are smaller than the wavelength of light, which would blur in an optical microscope. The lenses should also allow smaller features to be fabricated by laser patterning, which is used to etch transistors into silicon chips. See-through silver conductor for flexible smart screens.